BCS #172 rides into town today, a special Weird Western issue, featuring three Weird Western stories, a podcast, and a new episode of The BCS Audio Vault, all in honor of our new anthology Ceaseless West: Weird Western Stories from Beneath Ceaseless Skies, now available at ebook stores including Amazon, Apple iBooks, and WeightlessBooks.com. E. Catherine Tobler (“We, As One, Trailing Embers” in BCS #147 and podcast BCS 127, “Artificial Nocturne” in BCS #126, both in her circus world, among others) offers “Splitskin,” another of her strange time-traveling circus stories, this one with a unique west-America feel. Erin Cashier (“Eighth Eye” in BCS #49 and podcast BCS 043, “The Alchemist’s Feather” in BCS #25 and podcast BCS 023, and“Hangman” in BCS #10, podcast BCS 010, BCS Audio Vault 017, and the new Ceaseless West anthology) returns to BCS for the first time since 2009 with “Swallowing Silver,” a tale of family homestead tension amid a cursed outside threat. Shannon Peavey offers “The Snake-Oil Salesman and the Prophet’s Head,” in which the sideshow protagonist is accompanied by his brother’s severed head in a jar. The BCS Audio Fiction Podcast episode is BCS 149: Swallowing Silver, the Erin Cashier story, rendered in the taut voice of bleak family and a bleak situation. The new BCS Audio Vault episode with BCS #172 is BCS Audio Vault 018: Mister Hadj’s Sunset Ride by Saladin Ahmed, another unique Weird Western tale, which appears in our Ceaseless West anthology. It’s introduced by the author, explaining his exploration of fun Western tropes and rarely discussed history of Muslims in America. The From the Archives story with BCS #172 is “The Angel Azrael Delivers Small Mercies” by Peter Darbyshire, from BCS #102 and podcast BCS 087, another tale of his gunslinging fallen angel whose first story appears in Ceaseless West. All behind the great Weird Western cover art “Bandits Assault a Stagecoach” by Ignacio Bazan Lazcano, which appeared on our cover in Summer 2012 and also on Ceaseless West. To celebrate the release of Ceaseless West last week, we’re having a BCS ebook sale! Check here or at Weightless Books for details. It ends Tues. May 5! These and other dusty tales await in Ceaseless West: Weird Western Stories from Beneath Ceaseless Skies, our new ebook anthology of eighteen Weird Western stories from BCS, featuring authors such as Gemma Files, Saladin Ahmed, Peter Darbyshire, Ian McHugh, Kenneth Mark Hoover, E. Catherine Tobler, and more. If you buy Ceaseless West at Weightless Books, where we’re having a BCS ebook sale, you’ll also get a free ebook of our other BCS theme anthology, Ceaseless Steam: Steampunk Stories from BCS, and a coupon for 30% off all BCS anthologies and BCS ebook subscriptions. To celebrate Ceaseless West, we’re also doing a special Weird Western issue, BCS #172, on Thursday, featuring E. Catherine Tobler and Erin Cashier, and two recent Weird Western episodes of The BCS Audio Vault, and a reprise of the great Weird Western cover art from Late Summer 2012: “Bandits Assault a Stagecoach” by Ignacio Bazan Lazcano. 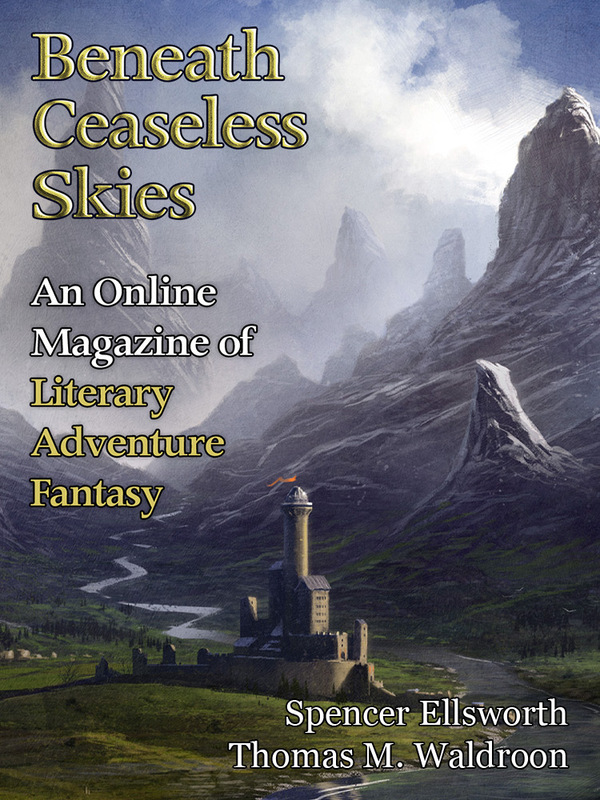 In conjunction with our new BCS theme anthology Ceaseless West: Weird Western Stories from Beneath Ceaseless Skies, and its special early release at WeightlessBooks.com, we’re having a BCS ebook sale at Weightless Books! Buy Ceaseless West at Weightless Books and you’ll get a free ebook of our other BCS theme anthology, Ceaseless Steam: Steampunk Stories from BCS, and a coupon for 30% off all BCS anthologies and BCS ebook subscriptions. BCS ebook subscriptions eligible for this 30% off include not only new subscriptions but also existing subscribers renewing or extending your subscription, regardless of when it ends. Subscribers can get issues delivered directly to their Kindle, smart phone, or tablet (any device with an email address), and they get new issues early, a week before the website. So buy a copy of Ceaseless West at Weightless Books to get your free ebook of Ceaseless Steam and the coupon for 30% off BCS anthologies and subscriptions. All proceeds go to pay BCS authors and artists, so it’s a great way to support BCS and get some awe-inspiring fiction too! But hurry; this sale ends Tues. May 5! 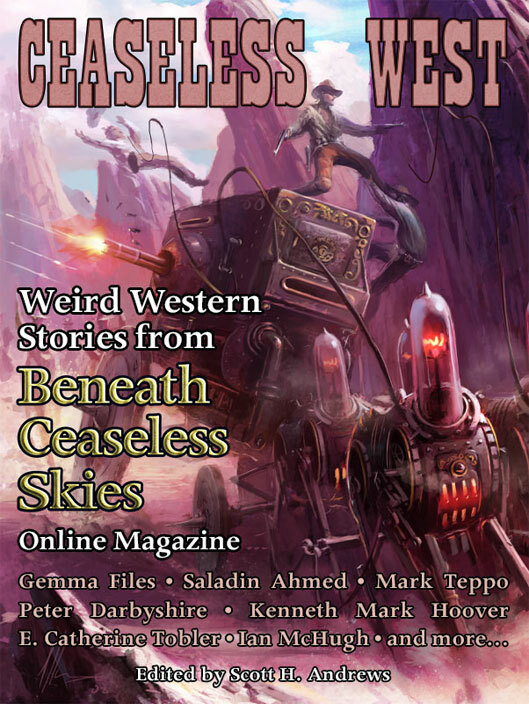 These and other dusty tales await in Ceaseless West: Weird Western Stories from Beneath Ceaseless Skies, our new ebook anthology of eighteen Weird Western stories from BCS, featuring Gemma Files, Saladin Ahmed, Peter Darbyshire, Kenneth Mark Hoover, and more. Ceaseless West releases next Tuesday Apr. 28, right before our special Weird Western issue, BCS #172, on Thursday Apr. 30. But right now, in conjunction with our BCS ebook sale at WeightlessBooks.com, Ceaseless West is available early at Weightless Books! Buy Ceaseless West at Weightless Books, and you’ll get a free ebook of our other BCS theme anthology, Ceaseless Steam: Steampunk Stories from BCS, and a coupon for 30% off all BCS anthologies and BCS ebook subscriptions. Out today is a new episode of The BCS Audio Vault: 018: Mister Hadj’s Sunset Ride by Saladin Ahmed, a Weird Western tale of a strange old man from the Old Country told by his bounty hunter companion as they trail a devilish quarry. It’s introduced by the author, explaining the story’s aim in exploring the fun tropes of Westerns while presenting a seldom-discussed aspect of the history of Muslims in America. 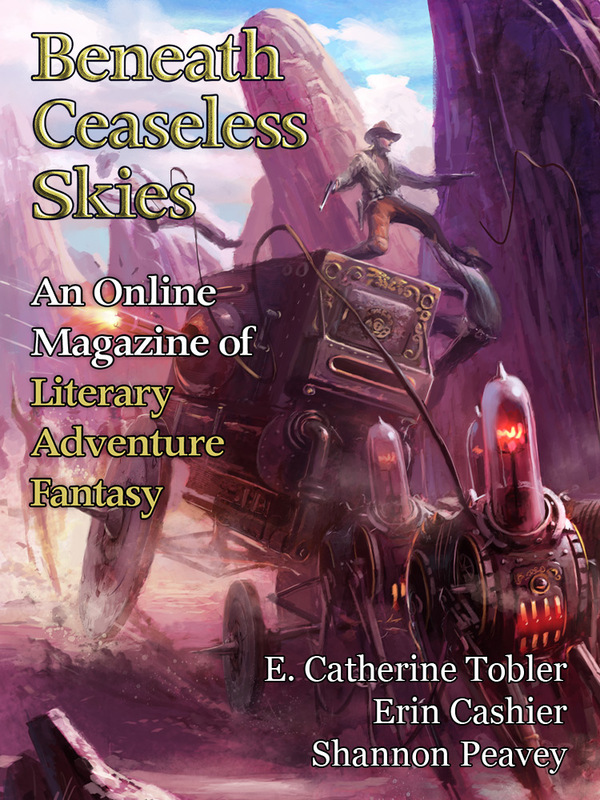 “Mister Hadj’s Sunset Ride” in its text version also appears in our brand new ebook anthology Ceaseless West: Weird Western Stories from Beneath Ceaseless Skies. Ceaseless West features great BCS stories by Kenneth Mark Hoover, Peter Darbyshire, Mark Teppo, E. Catherine Tobler, and Gemma Files. It will be released early on Apr. 23 at Weightless Books, along with a BCS ebook sale, and at other ebook retailers the following week. To hear new episodes of The BCS Audio Vault, including stories by Marissa Lingen, M. Bennardo, and Chris Willrich and introductions by Aliette de Bodard, Rajan Khanna and Lou Anders, subscribe to The BCS Audio Vault via RSS feed or look for it on iTunes. BCS #171 is out today, featuring a returning BCS author, a podcast, and a new episode of The BCS Audio Vault that ties in with our new anthology Ceaseless West. Spencer Ellsworth (“The Death of Roach” in BCS #85) returns to BCS with “The Fires of Mercy,” a tale of flight and consequences. Thomas M. Waldroon offers “Sinseerly A Friend & Yr. Obed’t,” a uniquely voiced story of mystery and family history. The BCS Audio Fiction Podcast episode is BCS 148: The Fires of Mercy, the Spencer Ellsworth story, rendered in the taut voice of a bleak situation. 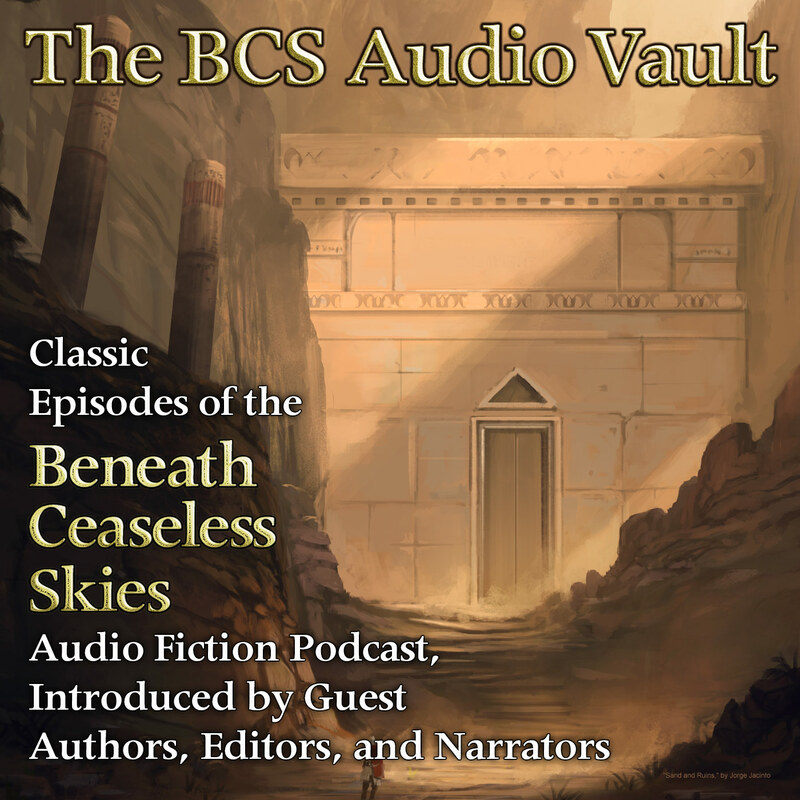 The new BCS Audio Vault episode with BCS #171 is BCS Audio Vault 017: Hangman by Erin Cashier, the text version of which appears in our new ebook anthology Ceaseless West: Weird Western Stories from Beneath Ceaseless Skies, due out next week. It’s introduced by the author, explaining the Western and Weird Western inspirations for the story and the narrator’s Western-style voice. All behind a new view of our spring cover art: “Twisted Mountain Valley” by Christopher Balaskas. Coming next issue: a special expanded Weird West issue! Multiple-time BCS author Ian McHugh’s new short fiction collection Angel Dust was a finalist for the Aurealis Award for Best Collection. Congratulations! 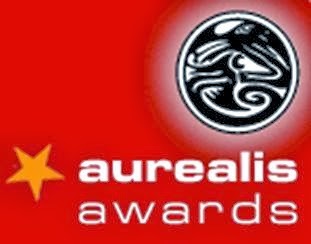 The Aurealis Awards recognise the best Australian science fiction, fantasy, and horror of the year. Past winners in the Best Fantasy Short Fiction category include Christopher Green’s story “Father’s Kill” from BCS #24 and podcast BCS 022, which won in 2009. Angel Dust includes two BCS stories, “Cold, Cold War” from BCS #123 (a past Aurealis finalist for Best Fantasy Short Fiction) and “Red Dirt” from BCS #58. However, “Songdogs” from BCS #27 appears in the new BCS anthology Ceaseless West: Weird Western Stories from Beneath Ceaseless Skies. Out today is a new episode of The BCS Audio Vault: 017: Hangman by Erin Cashier, from back in 2009, a tale of a world-weary hero called back to duty in a strange and dusty Weird Western world where the trains have gone feral and left their tracks. It’s introduced by the author, explaining her inspiration for the Western feel and voice in the story. “Hangman” in its text version also appears in our brand new ebook anthology Ceaseless West: Weird Western Stories from Beneath Ceaseless Skies. Ceaseless West features great BCS stories by Kenneth Mark Hoover, Peter Darbyshire, Mark Teppo, E. Catherine Tobler, Gemma Files, and Saladin Ahmed. It will be released early on Apr. 23 at Weightless Books, along with a BCS ebook sale, and at other ebook retailers the following week. Early release Apr. 23 at Weightless Books, along with a BCS ebook sale!